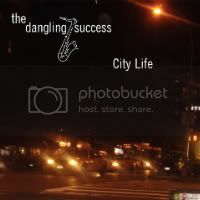 The Dangling Success's Page - THE JAZZ NETWORK WORLDWIDE "A GREAT PLACE TO HANG"
They form the ultimate Groove/R&B/Smooth Jazz band that can only be described as “an aphrodisiac for the spirit.” That's the story behind the dangling success! Five seasoned musicians with varied backgrounds got together to play music with the kind of soul that moves not only your feet, but your spirit too! These musicians have already paid their dues with acts like the Isley Brothers, Don Mclean, Roy Orbison, the Shirelles, John Platania, Bernard Purdie and Guilherme Franco. But you've never heard them like this. All at once, it's smooth and sultry, yet energetic and electrifying. Sweet and sweaty sax melodies by Mark “Dr. Sax” Neikrowitz soar above the textured and smart rhythms of guitarist, Gioron Wilkins. Solid and soulful polyrhythms crack from the snare drum of Paul Rossman. Keeping the low end melodically satisfied is Mike McDonough on bass while Dan Odescalchi fills the musical crevasses on keyboards. Aloha e My Dear Friends...So sorry for the late response but I hardly come to my site here...although this new year I will be spending a lot of time here getting to know many of my friends here at jazznetwork. Thank you so much for your friendship! Nice to meet you all! Hope you'll come to listen and join my Internet Jazz Radio Station. I'll be very appreciative of your opinion! Your music sounds wonderful! thank you for befriending me. Thanks for befriending me, your music sounds wonderful! Thanks for the friend request. We love your page... Prosperity be with you always! Hi All,your music composition Awesome.I Like it. Hello Dangling,Thanks for yours Friendship. The Dangling Success is an all-instrumental smooth jazz band that maintains a steady groove throughout their recent release City Life. Rather than focusing on the negative aspects of living in the city the band’s view is one that is positive and alluring as shown on the cover. The picture invites you to a late night jazz club where you can unwind and find yourself in a place that you will want to remain.